The trumpets pictured in the calendar are significant because in many instances they are part of the professional accomplishments of great trumpeters going back one hundred years and more! Time marches on, but the hard working energy of trumpet players and trumpet makers is a constant. 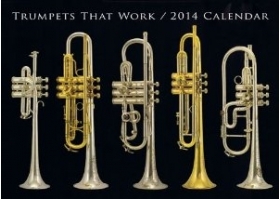 The "Trumpets That Work" calendar shows instruments used by renowned players, and also some interesting trumpet designs made with equal energies of creativity and pride. These instruments come from around the world, and each page includes additional information about their history and design. Several of these trumpets are property of the Chicago Symphony Orchestra, and many of them relate directly to the history of the CSO trumpet section. Accordingly, a portion of the revenue from the sale of these calendars will be donated to the CSO. This is an excellent gift to give to all of your favorite trumpet players, and of course for anyone who loves looking at trumpets and learning about their history! Here's an idea - buy TWO calendars and use one as a regular wall calendar and use the other one to make 12 awesome looking framed pieces of wall art in your trumpet studio! 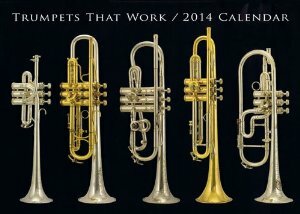 Here are the instruments that were featured in the 2013 Calendar. Don't wait get your copy of the 2014 Calendar NOW! !